I wasn't planning to come here and I certainly didn't do any research. Doh! California must have had a soporific effect on me, all that food and comfort - luxury, in fact. It was T's idea to travel overland from Mexico City to Guatemala. And 6 weeks later, we are still here, in Mexico City. Loving it. It's certainly big. And the culture is very interesting. People are into black magic here and their biggest festival is the Day of the Dead in November, where they celebrate lost ones. The weather is good, pretty much always sunny enough to burn. Showers don't last long and don't appear to be common right now, it must be a week since we saw any rain. We've met many nice people. Mexicans in general appear to be very gregarious and generous. And many are ambitious, certainly in the city where there is a lot of big business - the number of people keen to learn English is testament to this. There's a lot of tangible poverty ... and also enterprise. One example, which brightened up tube journeys for the first few times - and now is just annoying because I have settled back into walkman "shut-off" mode - is to go from carriage to carriage with a loudspeaker on your back, playing the hookey cds you are selling. All sorts of things are sold on the tube - books, learning dvds, sweets, pens. Sellers get on and loudly announce their wares, while most look on slightly bemused. There's a fair amount of wealth too. Centro Historico is (completely) owned by Carlos Slim Helú, 3rd richest person in the world, whose fortune is around $50 billion. You hear quite a lot about him here - many people don't want to give him any more money, which is difficult because he owns pretty much all the telecoms, facilities, banks and major stores in Mexico. Mexico has a tube system, pretty like our own. Using it every day, I am just starting to feel some of the same, familiar ... let's say "negative" .. feelings when it is very hot and packed. They don't mess about here, proper steam into the carriages. The tube was built in the 60s and won an award because it uses icons to distinguish each station, very important in a country where illiteracy is high. The system is good, but unfortunately not ideal for me, with my height - I have to stoop quite low in order to get the required angle to make out the station through the carriage window. Mexico City is at 2,200m, so climbing stairs is a surprising effort when you first get here. People from Mexico City have big rib cages, due to the aforementioned altitude. There's so much to see - many good museums, historical sites, markets, attractive areas. My current favourite is Coyoacan where I am right now. Too many tourists, but a really pretty church and square arrangement, little boutique stores, restaurants, cafes and bars and the residential areas are very European - wide streets, nice brickwork, trees. This is where I take most of my English lessons. Tania and I are both helping Mexicans to practise their conversational English, and - poco a poco - learning Spanish on the way. It's reasonably cheap to stay in Mexico City. We are still in a hotel room, because it is convenient and cheap ($10 a night for 2) but we are looking for an apartment, which will work out about the same price, but will involve some kind of kitchen space and living area, which will be nice. Food is plentiful, varied, not so healthy (on the whole), and cheap. Too much meat and cheese! (Good though). Tacos are around 50 cents each and many small local restaurants do 3 course meals for $3. 3. 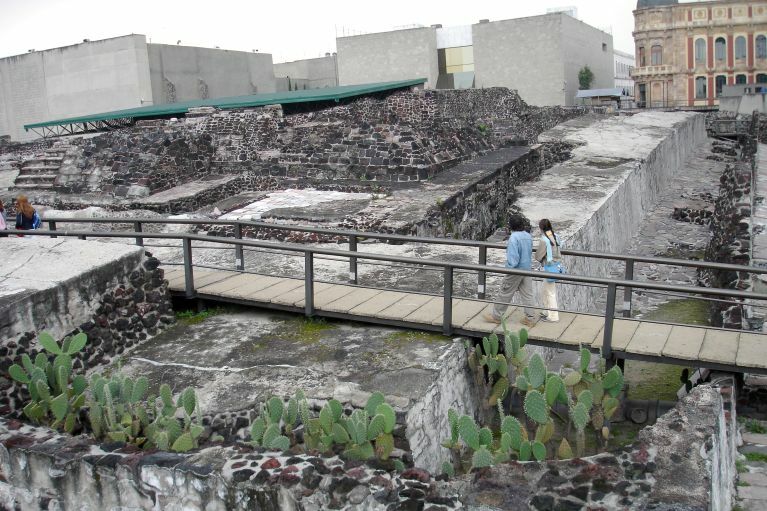 City centre - particularly the Cathedral in the main square and Templo Mayor - the remnants of the Aztec Temple that the colonialists simply built over when they arrived, idiots. There's a big and growing archeological site in the middle of the city, there must be so much more under there. The ancient city was built on islands in the middle of 3 massive lakes surrounded by mountains. The earth is therefore very moist, leading to the interesting fact that Mexico City is sinking something like 4cm per year. The architecture in Centro Historico is both stunning and slightly "on the piss", as we say, due to the sinking. 4. Chapultepec Zoo. It's free! 5. The amazing Museum of Anthropology, again in big and beautiful Chapultepec Park. And tons more - both seen and to see. Didn't the mexicans find you a bit boring?